Michael Cohen agreed Monday to voluntarily talk to House lawmakers but behind closed doors after concerns a public hearing would endanger his family. He has, however, tentatively agreed to testify in public after, last week, he canceled that scheduled appearance. Cohen will appear before the House Intelligence Committee on Friday, February 8, but in a private sit-down with lawmakers. 'I want to thank Michael Cohen for agreeing to appear voluntarily before the Committee for closed testimony on February 8, 2019,' panel chairman Rep. Adam Schiff said in a statement on Monday. 'We will continue to work with Mr. Cohen and law enforcement in order to protect Mr. Cohen and his family,' he added. 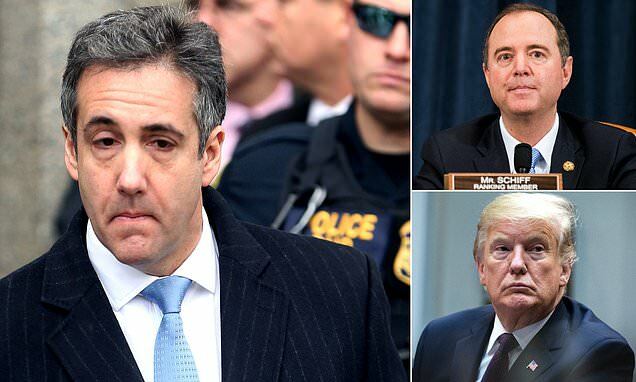 And President Donald Trump's former fixer has tentatively agreed to go through with his planned public testimony before the House Oversight Committee, Cohen's new lawyer Michael Monico told CNN. Cohen was originally scheduled to testify before a joint House Oversight and House Judiciary Committee hearing on February 7 in his first public testimony since he plead guilty to lying to Congress. But he canceled that appearance last week citing 'ongoing threats against his family' from the president and the president's lawyer. Lawmakers, however, made it clear they were unwilling to let Cohen off the hook and mulled subpoenaing to appear. Monico said Cohen wants to cooperate with all of the congressional inquiries, including one before the Senate. The scheduled appearances mean Cohen will talk to House members before he is grilled by senators. The Senate Intelligence Committee subpoenaed him to testify on Feb. 12. He will likely face different topics of inquiry in each setting. Schiff said he wanted Cohen behind closed doors to speak about his dealings with Russia while the House Oversight panel made it clear Cohen would not speak about special counsel Robert Mueller's investigation in a public setting.